Often, a kitchen’s design is all about balance; balancing the practical requirements with the aesthetic impact or balancing dual, sometimes opposing, aspects of a brief. 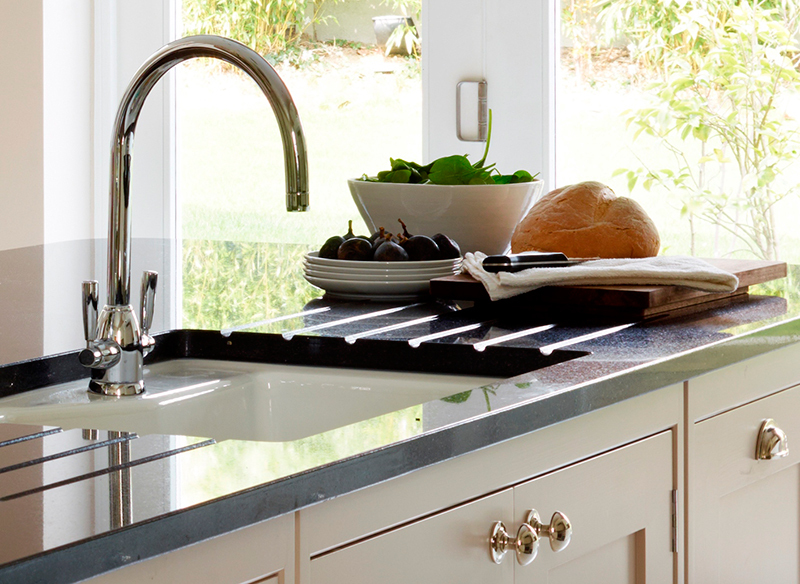 But our Orford kitchen takes the concept of balancing a scheme one step further. Careful consideration and incorporating the stunning Suffolk shoreline which surrounds it, the Orford project manages to balance an eclectic edge with a calming feel, and a coastal and warming atmosphere with a contemporary and bright vibe. Neatly tucked away in a bank of tall cabinets is the storage backbone of the Orford kitchen. Sandra, the homeowner, loves baking so somewhere to store her cooking essentials as well as some of her latest baking creations was high on the priority list. 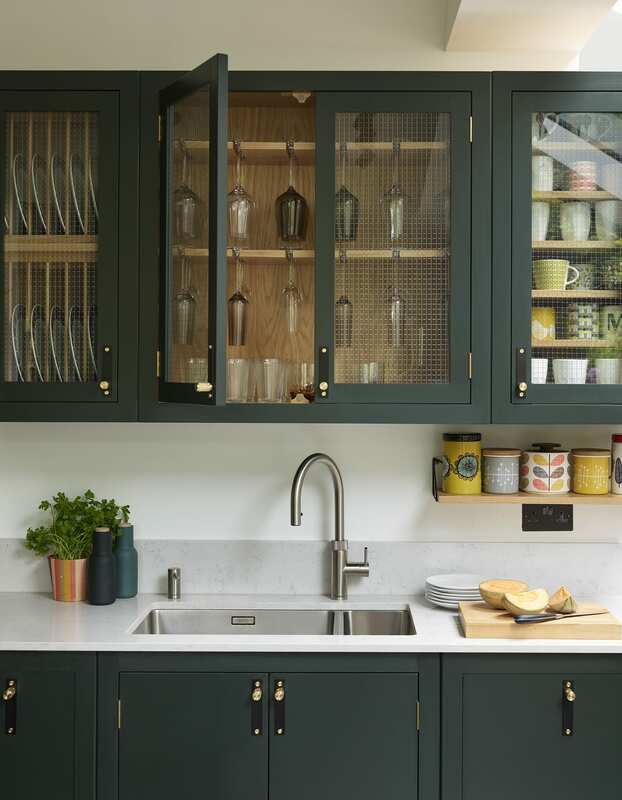 The spice racks on the back of the doors utilise this additional space ensuring each herb, spice or bottle is within easy reach. 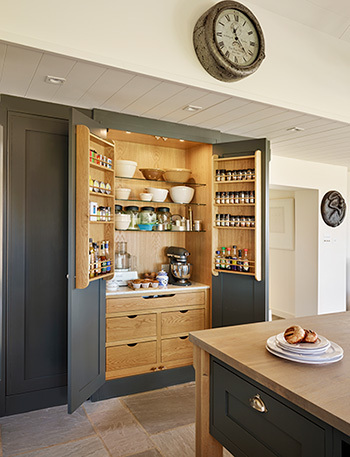 The positioning of the pantry in relation to the island also makes it effortless to move between the food preparation space and the main storage area. The island was an integral part of this brief, designed to be a fully functional food preparation space within easy reach of the cooking area on the back wall, sink on the side and pantry at the other end. 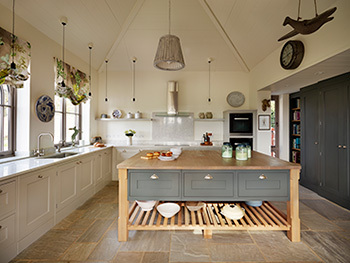 The combination of weathered oak and dark grey fits perfectly into the relaxed, coastal scheme adding to the rustic, organic feel of the design. An example of form and functionality working in perfect unison. 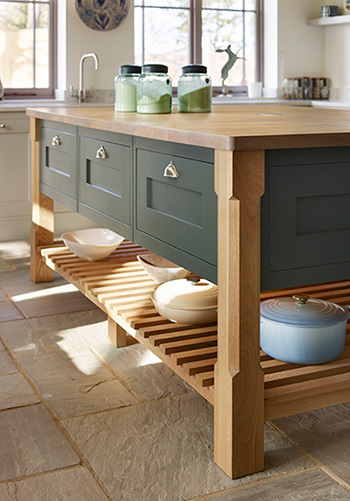 For a couple that enjoy nothing more than having the whole family round for Sunday lunch, the open pot board on the kitchen island is the perfect place to store their large casserole dishes. The deep drawers in the top of the island store everything from cutlery to teacups with the oak pot board reserved for the heavier items. Aesthetically, the openness of the pot board helps light to flow through which adds to the bright and spacious feel in the room. 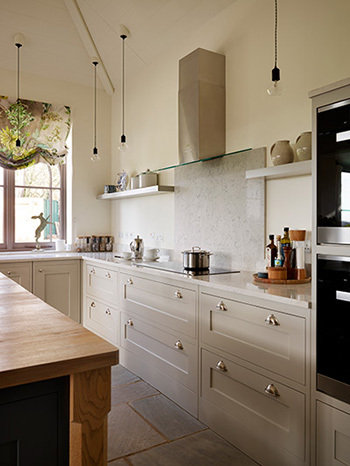 When Sandra and Ian moved into their former lodge house in the Suffolk countryside, they always dreamt of adding a garden room extension to the property to create a relaxed open-plan kitchen, dining, living space. The dining table separates the soft seating in the garden room from the island and main kitchen area. 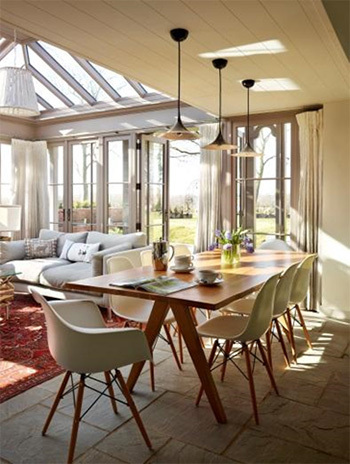 With a formal dining room next door, this everyday dining table is the perfect spot for the family to gather over breakfast and enjoy the sun as it streams into the garden room. 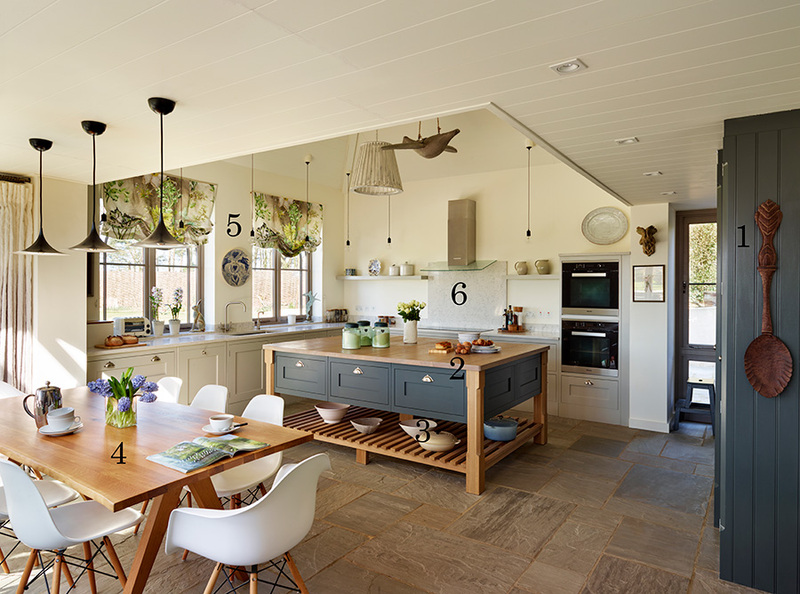 With views overlooking rolling country fields, the sink is positioned by the windows at the far end of the island complete with a mixer and separate boiling water tap. 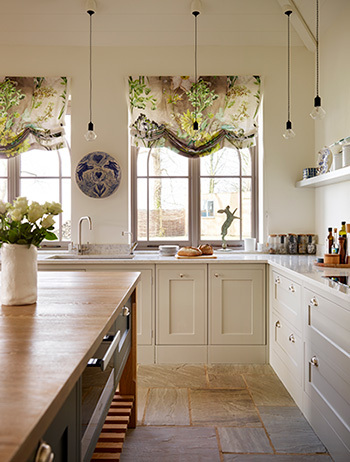 With a keen interest in ceramics and textiles, Sandra sourced her own fabric for her bespoke blinds and has finished off the kitchen design with ceramics and accessories collected over years of travelling. It’s the personal finishing touches to this room that really help to bring personality and unity to the scheme. Miele appliances were chosen by Sandra and Ian for their reliability as well as their streamlined look. The hob, ovens and warming drawer (situated in the island) are all within easy reach of one another to make cooking a breeze. Wherever possible, the appliances are integrated so the cabinetry isn’t overshadowed. In-keeping with the pared back, coastal ambiance the silestone worktop is continued up the wall, acting as a splashback with its subtle grey vein adding a sense of texture to the scheme without complication. If you would be interested in talking to us about your upcoming kitchen project get in touch. Why Choose Perrin & Rowe?